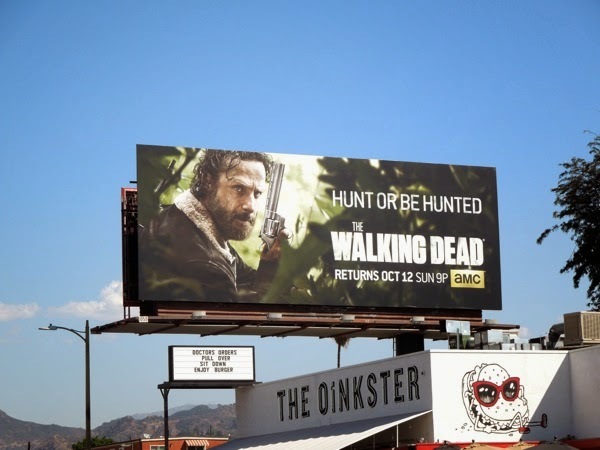 At first glance Daily Billboard wasn't sure we liked the latest season promo billboard for The Walking Dead, as it just looked like 'Rick Grimes' still needed a good shower, shave and haircut, but spying the 'Hunt or be hunted' tagline for the fifth season it all fell into place. 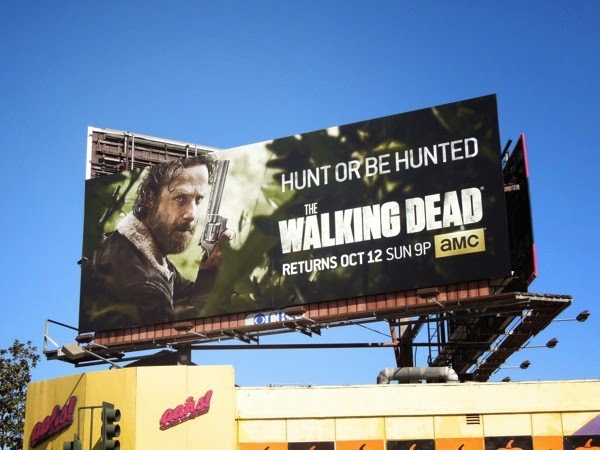 For too long Andrew Lincoln's former sheriff deputy and his intrepid band of survivors have been on the defensive, or racing from one perilous situation to the next chased by the undead or human madmen, so it's exciting to see the plucky group go on the offensive. 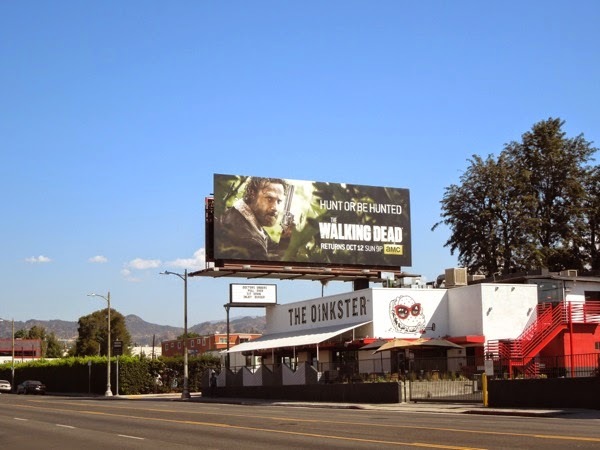 The AMC show based on Robert Kirkman's post apocalyptic zombie comic book series continues to go from strength to strength in terms of viewing figures and dramatic storytelling, despite being constantly snubbed by industry awards voters. 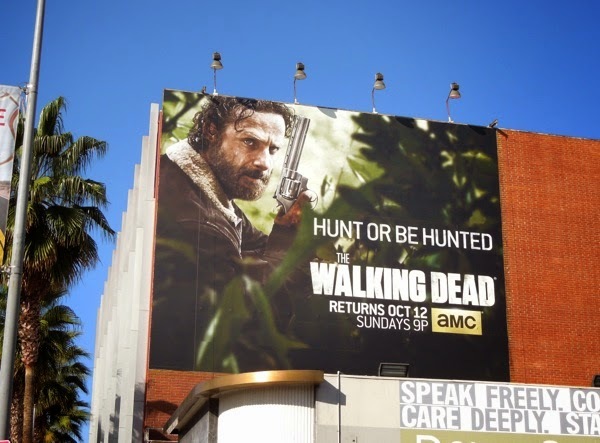 At the end of the fourth season we left the majority of the survivors finally reunited and locked in a railroad car at the mercy of human cannibals at the seeming sanctuary of Terminus, with Rick proclaiming they were messing with the wrong people. 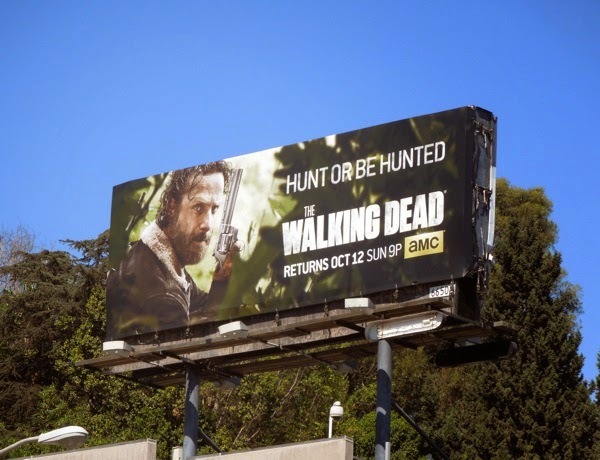 These 'Hunt or be hunted' season five billboards were spied in multiple locations along L.A.'s busy Sunset Boulevard on September 5, 2014. 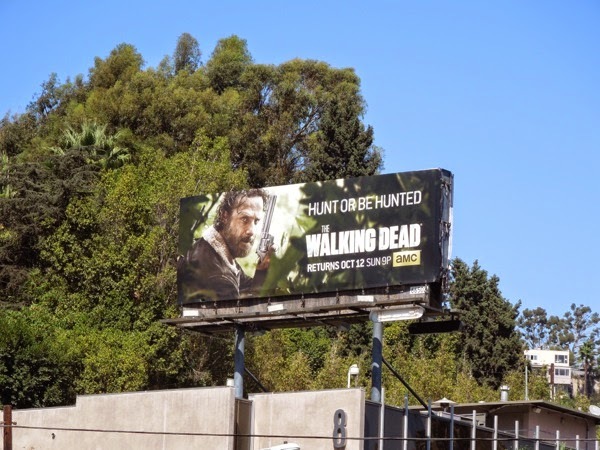 If you're a fan of the spectacular show, be sure to check out all the previous season promo billboards for The Walking Dead, plus the Emmy Award consideration ad campaigns which so far have been in vain. 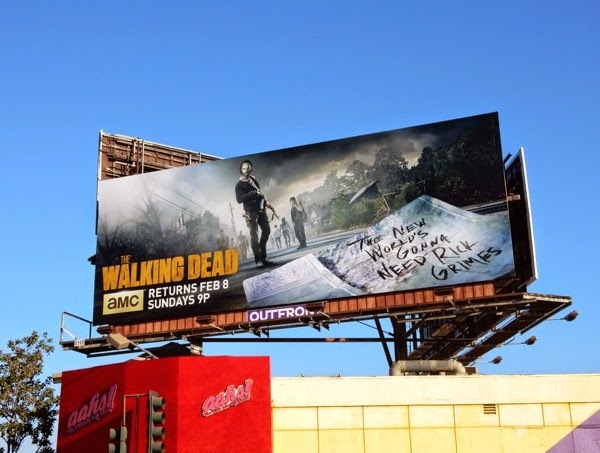 Now bring on the gruesome zombies, all our favourite Walking Dead characters ('Daryl', 'Michonne', 'Carol', 'Maggie' and 'Glenn' to name a few) and the usual shocking twists and turns this series continues to deliver. 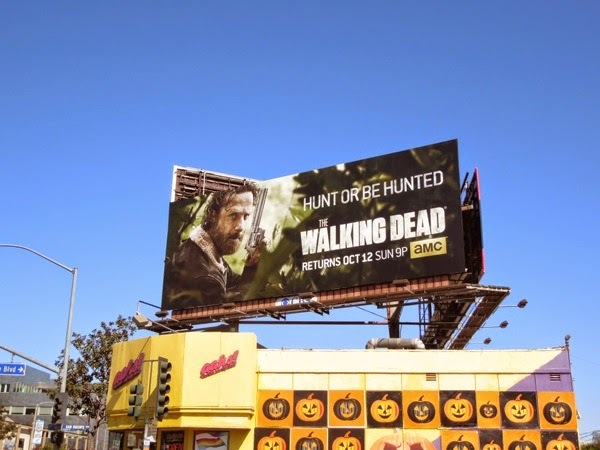 UPDATED: Plus here's the fifth season billboard boldly standing out along L.A.'s Vine Street on September 16, 2014. 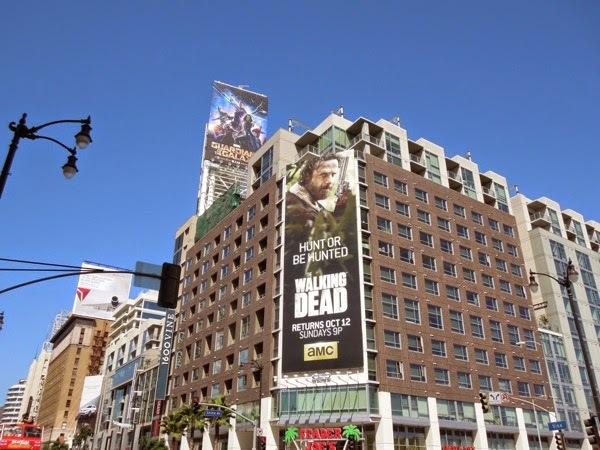 And an additional vertical creative with Rick towering over Sunset & Vine in Hollywood. 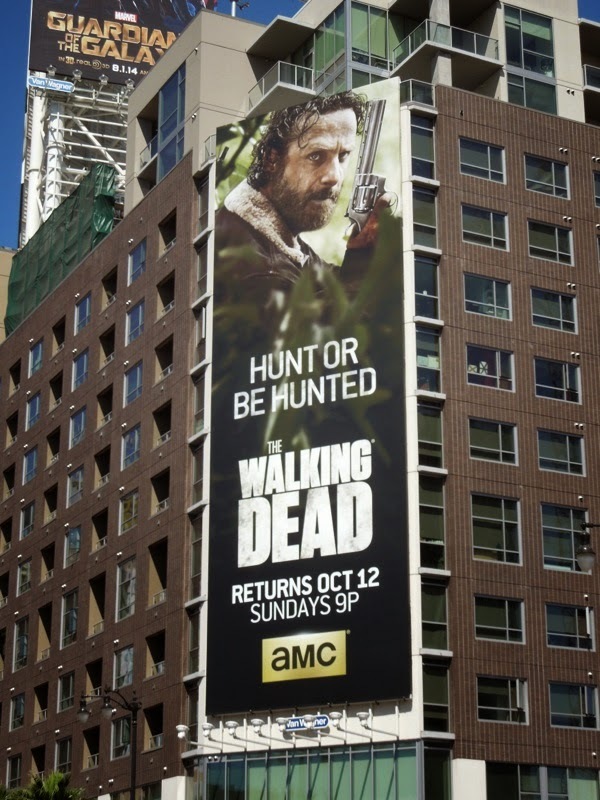 Roll on Sunday October 12, is what we say. 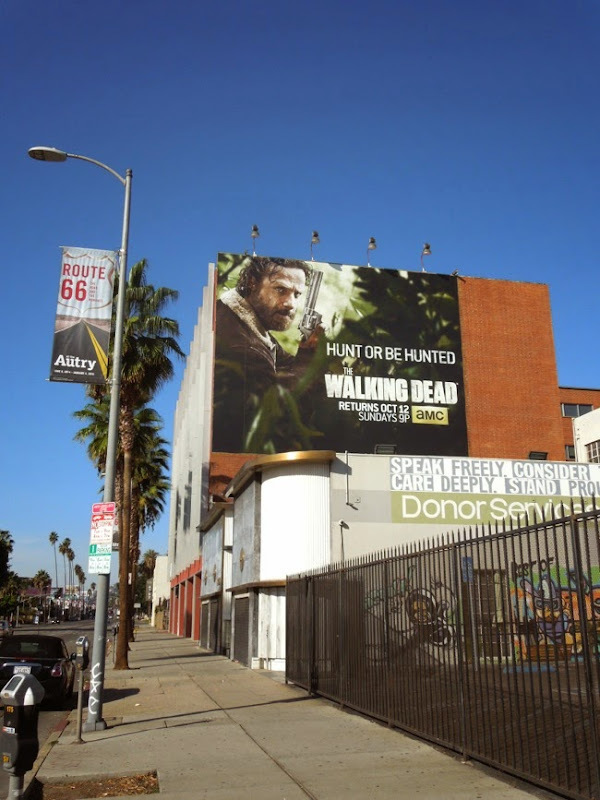 UPDATED: Here's another larger season five billboard for The Walking Dead recently spied along Sunset Boulevard in Hollywood on November 16, 2014. 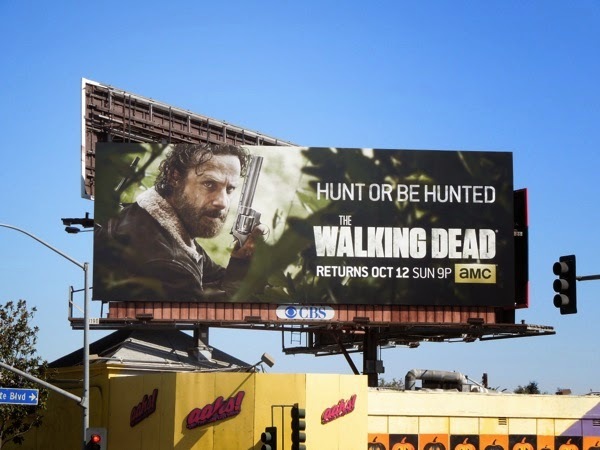 The fifth season certainly started with a bang which lived up to the 'Hunt or be hunted' tagline, and Daily Billboard wonders if we'll be seeing another set of ad creatives for the mid-season when the show returns in 2015. 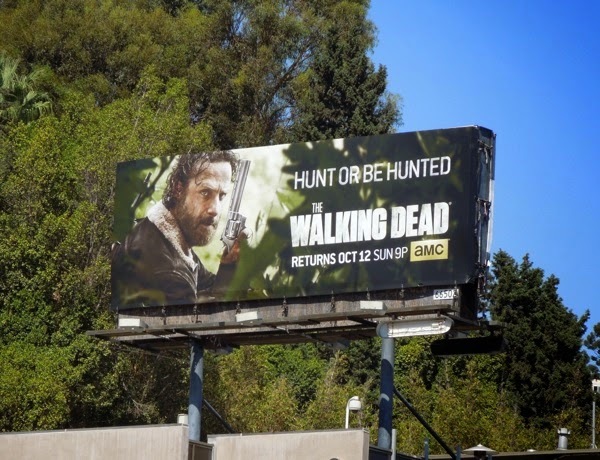 UPDATED: The first half of season five was certainly eventful, chock full of zombies, cannibals and civilisation flipped on its head (and more than enough shocking deaths), so what will the second half hold. 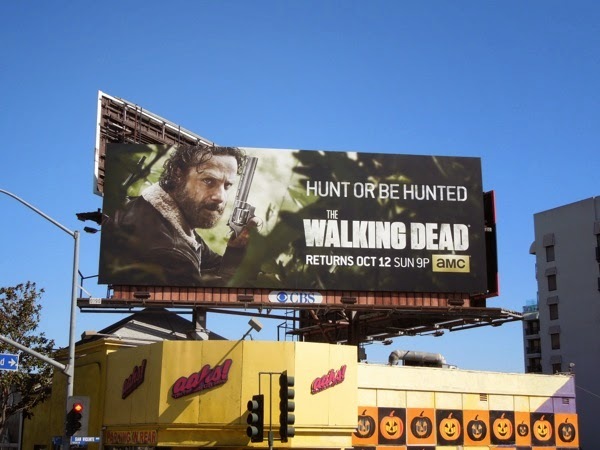 Maybe this mid-season five billboard featuring Rick Grimes and the rest of his band of survivors holds some clue, as they hit the road after the death of 'Bob' and 'Beth', and the truth about there not being a miraculous cure to the zombie apocalypse (that they know of). 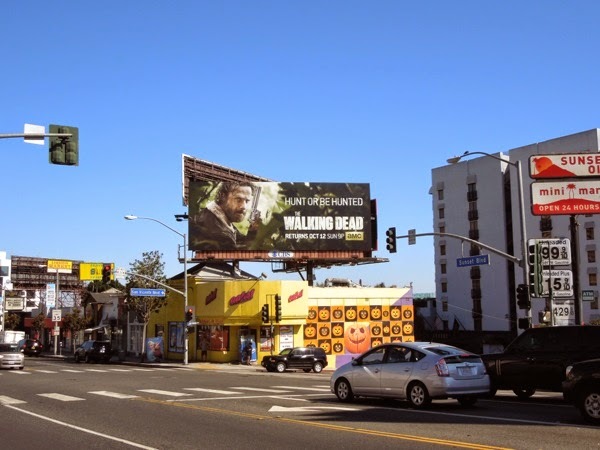 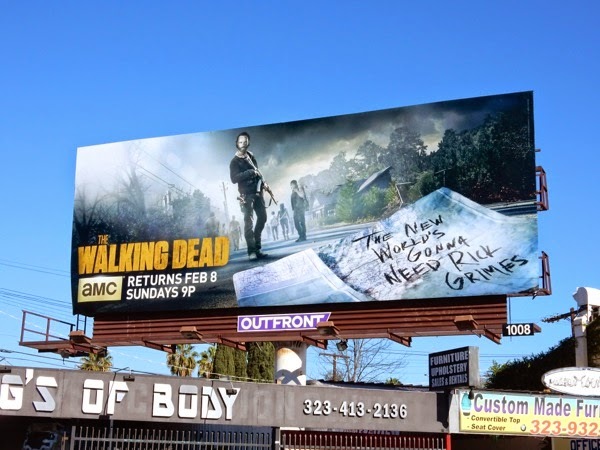 This 'The new world's gonna need Rick Grimes' billboard was snapped along the Sunset Strip on January 13, 2015. 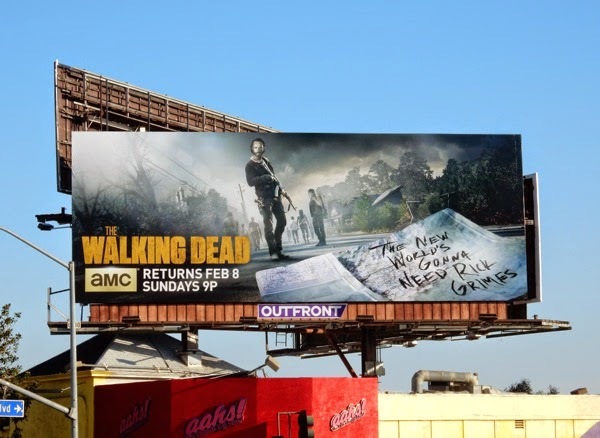 Roll on Sunday February 8. Plus here's another equally impressive billboard spied along Melrose Avenue the next day. 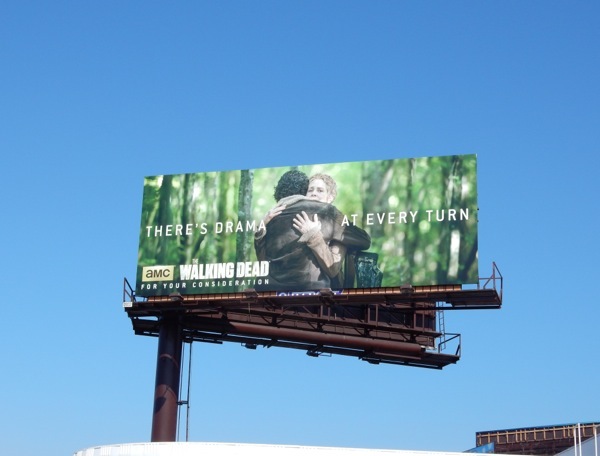 UPDATED: Here's also a first glimpse of the 2015 Emmy campaign for The Walking Dead, with this Carol and Rick 'There's drama at very turn' reunion hug billboard snapped along Pico Boulevard on June 7, 2015. 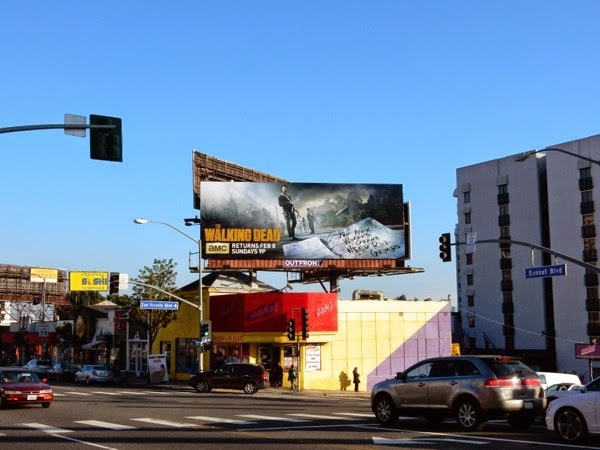 Daily Billboard is sure more will follow.